1. Heat the olive oil or butter in a sauce pot until hot just under medium heat; add the bacon, onions and celery on medium high heat. Sauté this mixture until the mixture is fragrant and until the bacon lightly browns. 2. Then add in the flour. Stir it evenly and cook for 3 or 5 minutes to create a thickening agent. Now add the potatoes and thyme. Stir it around so that it gets coated evenly. Cook this mixture for another minute. 3. Then add the clam concentrate, fish concentrate and water while whisking it together and scraping the bottom of the pot to ensure that the brown bits on the bottom of the pot are loosened and mixed into the liquid mixture. Let it simmer for 30 minutes and skim off any impurities or grease. 4. Add the chopped clams once the impurities are skimmed off. Then temper the heavy cream and add it back into the chowder. Adjust the seasoning with salt and pepper just before taking it off the heat. 5. 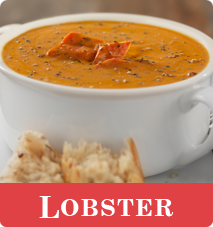 Transfer the soup into a proper container for service or to let it cool down. 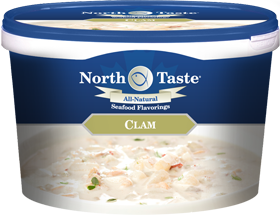 Cool the chowder down according to HACCP Procedures and refrigerate when not in use.